There's little I can tolerate when it comes to housemates. Reason that I completely share Henry Willows' pleasure in having the house to himself on a quiet winter night. A backgrounder on why he's alone: he's a divorcé, whose children are now in the care of his ex-wife, Sue and her new partner. In a parallel universe, he may be spending the evening with his family instead of a tumbler of whisky. Henry's son, Matthew has not yet given up on that happily-ever-after dream; and thus makes an unannounced visit, his possibly pregnant girlfriend, Christine in tow. 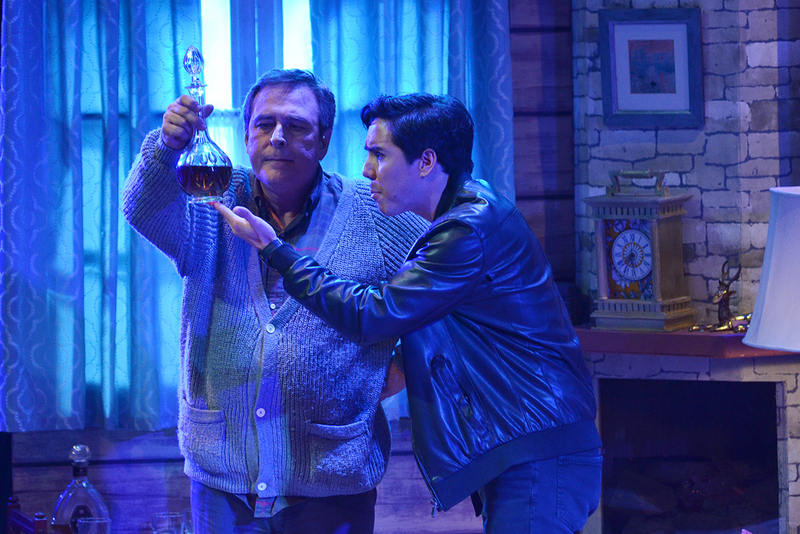 Miguel Faustmann and Andres Borromeo play father and son in Repertory Philippines' staging of Father's Day by Eric Chappell. Repertory Philippines presents Father's Day by Eric Chappell. 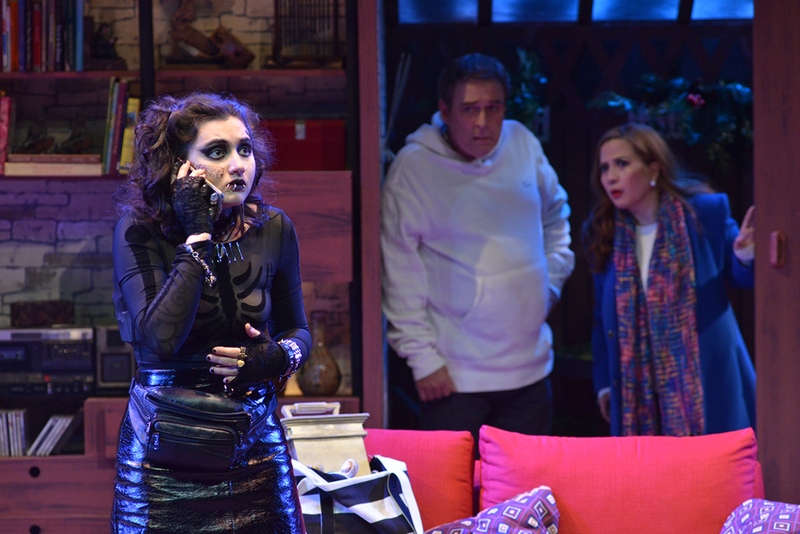 The show, based on the playwright's hit sitcom, Home to Roost, is directed by Baby Barredo and runs until 14th April at Onstage, Greenbelt – Makati. If there's anything that bugs me about the play, it's the thought that I might be crankier than Henry (Miguel Faustmann) — a high bar — and more old-fashioned than I dare admit. Matthew (Andres Borromeo) is driven by good intentions. Pulling off a parent trap is sweet, agreed. But steal money and fiddle with private property? Not cute. And his ploy seems to be working as Henry and Sue (Liesl Batucan) get cozy, to understate. Love is in the nippy air, and so is infidelity. Maybe I've forgotten to bring my sense of humor or maybe I'm just a grinch. What's certain is Chappell can write cutting put-downs. The repartees are laugh-out-loud funny when done well, though in some moments lacking the bite we've come to expect from a British comedy. Becca Coates and Liesl Batucan complete the cast of four. All four actors are dealt with flawed characters, with quirks that can annoy the hell out of you (Sue's shrill retorts, Matthew's wing-it attitude, Christine's constipated look). Among them, Faustmann has been the most successful at earning sympathy, making his sour Henry likeable. Confession: I connect deeply with Christine (Becca Coates). Not because of her gender and punk proclivities, but because she doesn't speak much and runs away from her problems. We are difficult to live with. No exceptions. Deciding to carry on living with someone somehow means learning to quarrel productively. At curtain call I overhear an audience member tell his companion, "Simple lang" and I could hear a smile, an evidence of fondness for the light-hearted performance. This is why we bother with theater. To escape reality, yes, but also to manage our sorrows. However briefly, holding a family together is simple.